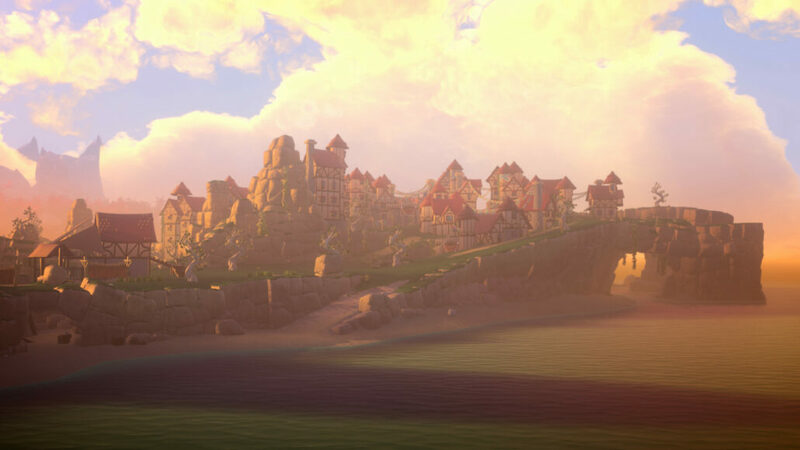 Yonder: The Cloud Catcher Chronicles is hard to categorize. It meanders with a pleasant, lazy pace through half a dozen genres and homages without ever feeling completely settled on any one thing. After hours and hours of playing, I still felt like the game was hiding something from me, that, if I turned the right corner, I might discover yet another feature, mystery or area. Even on the face of it, it’s hard to describe. You, after a brief stint talking to strangers on a boat, find yourself shipwrecked on an island. It’s a colorful, vibrant world that you’re more or less left to explore and conquer. Villagers will have fetch quests and trading jobs for you, collectibles can be found hidden in nooks and crannies, and the environment is yours to tame with farming, fishing, and mining to be exploited as well. On top of that there’s a character to create and customize with hundreds of options to make them unique and, as always, ridiculous. However difficult to label Yonder: The Cloud Catcher Chronicles may be, one thing is certain. This is a game for children. The stakes are not high on this island, despite the apparent threat of the murk, a purple cloud that blocks some paths and buildings, you are never in any danger. You don’t have to eat to stay healthy, nor sleep to recharge your stamina. You don’t have to balance your sun exposure or be wary of the monsters that lurk when the sun goes down. Like Stardew Valley, this is a tranquil adventure, leaving the player to explore and live at their own pace. For those seeking an action soaked death match, the island of Battlegrounds is for you; this sweet patch of paradise is for those who want to take it easy. That said, you move remarkably fast across the island. Dashing from the beaches to the fields to the forests at a breakneck speed means you can cover the entire island in minutes if you felt like it. Luckily this means you can also rush through the fetch quests easily enough, and find quests for that matter. More or less everything is visible on the map, from the landmarks to quests markers so you don’t have to talk to every NPC looking for something to do. But despite its lovely visuals, friendly soundtrack and swath of things to do, Yonder is a little rough around the edges. No matter how fast you run across the island, the controls are still a little awkward, almost as if the ground beneath you is the tiniest bit slippery. It doesn’t really hamper the game in any meaningful way, though the controls feel more like you’re driving in LA Noire rather than controlling a person, albeit with no consequences. The cut scenes and moments where the game snatches the controls from you are equally wobbly. The dialogue between you, the characters and the adorable fairy creatures is at best passable, but the way the camera jerks around is offputting. Sometimes it feels like the game is moving too fast for itself with loading screens or actions smashing through the screen unexpectedly. The HUD is underwhelming and menus, however user-friendly, are just tedious. They look like they were built for an MMO that was created at the same time as Blizzard’s mega-hit World of Warcraft. Something about them is dated and lacking the smoothness you expect from other adventure titles. 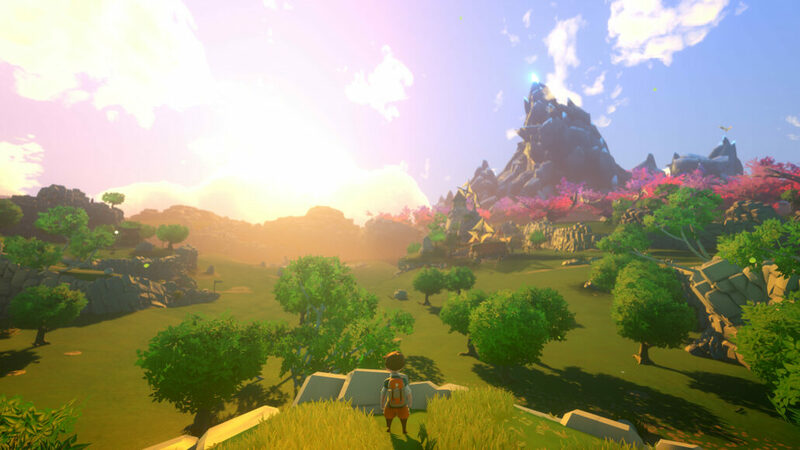 The tale of Yonder isn’t very important, nor very interesting for the player, so these moments of cluttered storytelling are more of an irritation than a detriment to playing, but it can break the illusion of this pretty little land. If you wish, you can follow the main quest and try and uncover the mystery behind the murk, but honestly, it’s much more fun to wander and farm than listen to the strange figure in your dreams. Finding the adorable abominations across the island was a personal highlight for me, from the fluffy cows to spherical rabbits and hedge pigs, these creatures are just fun to watch as they traverse the impossibly colorful world. Like Terraria, you’re sort of left to do what you want, although there is a lot more structure here. You never quite feel like the game lets go of your hand, but at the same time, it sometimes feels likes it’s keeping you away from something, rather than guiding you to it. I’m still not sure of everything you can do in Yonder, its array of secrets are seemingly hidden in plain sight, but if it never explains them, you might never encounter them on your own. There are little annoyances here, like the need to constantly swap tools to do things, but for the most part, this is a wonder filled, quiet and occasionally engrossing game. The fact that Yonder feels like it’s hiding something from you gives it a special place in the mind, as you study strange structures or possible paths in the distance. It always feels like there’s something more to do which is a blessing and a curse for the game, despite its lack of combat. Although it’s easy enough to move on to whatever other titles you might be playing at the minute, you might just catch yourself doing one more thing a few times before you finally leave the island. It doesn’t have the same gimmicks as some similar games but there is enough here, especially for children, to while away a rainy afternoon with a few cuddly animals. Reviewed on PlayStation 4 (code provided by the publisher). You can buy it via Amazon. Despite a few minor hiccups, Yonder offers a beautiful world to explore at your pace. You won't be fighting legions of demons to save the island, but you do collect cats and the likes.